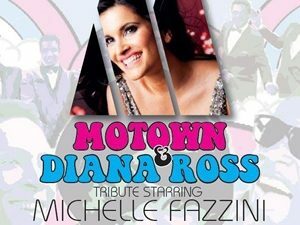 Saffron tribute to Diana Ross & Mortown for weddings and parties. Saffron is a fabulous tribute to Diana Ross, Whitney Houston and hits from the Motown era. Impersonating one of the world’s greatest female solo artists is no mean feat, performing two- almost impossible. Michelle Fazzini known as Saffron is more than up to the task with a voice & talent unmatched by most other Tribute Singers. This is a real class act who performs with all the style and grace of Diana Ross and all the power and gravitas of Whitney Houston. Saffrons live vocals pay tribute to these two mega stars of modern music with a self-contained solo tribute act that is perfect for Concerts, Clubs, birthday parties, wedding receptions, and corporate events. Saffron handles songs by Diana Ross the legend of soul and Motown including ‘Chain Reaction’, ‘Stop! In the Name of Love’, ‘Where Did Our Love Go’, and ’You Keep Me Hangin’ On’ entertaining audiences of all ages. With “The Supremes”, Few singers can match the incomparable vocals of Whitney Houston with her fabulous Vocals and her brand of R&B taking the world by storm. ‘I Will Always Love You’, ‘When You Believe’, and the emphatic ‘I Wanna Dance with Somebody’ are party starters and a sure-fire hit at birthday parties and wedding receptions. A consummate professional with a beautiful voice and natural stage presence Saffron comes fully self-contained with a professional PA system backing up her incredible voice. Added to this are meticulously detailed dresses and evening gowns and a professional makeup and you’ve have booked an act as visually stunning as she is entertaining. Saffron performs classic Motown hits including ‘Midnight Train to Georgia’ and ‘I Heard It Through the Grapevine’ Saffron will tailor her set to suit each and every occasion.